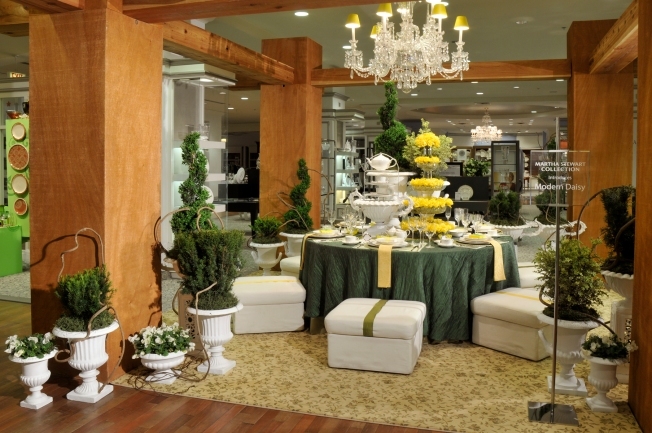 Macy's Flower Show will feature inspired tabletop designs. As sure as there are sprouts of green starting to appear around the city, the annually anticipated Macy's Flower Show is set to bloom at the State Street store starting on Sunday, April 5. This year entitled "Dream In Color," Macy's salute to spring will feature flowers arranged in the hues of the rainbow, a variety of locally grown plants and a plethora of pink flamingoes. The kitschy lawn ornaments will come to life -- literally -- as two-tiered potted planters constructed from 5,000 pink kalanchoe flowers stationed on the first floor. Flamingoes will also play into the floral theme throughout the rest of the store, including the brilliantly decorated windows along State Street. Eight handcrafted metal birds decked with feathers, seeds and spices will float seven feet over the main aisle of the first floor, while the seventh-floor Walnut Room will host a colony of flamingo lawn ornaments grazing amongst hundreds of vibrant flowers and plants in the restaurant's famed fountain. This year, Macy's has partnered with Green View Companies, a landscape, nursery and design group based near Peoria. Thousands of flowers and plants grown throughout the Midwest as well as in greenhouses in California, Virginia and Canada specifically for the Flower Show will grace the store. Following the "Dream In Color" inspiration, many of the blooms will be arranged in blocks of rainbow colors. For the first time ever, more than 20 15-foot cherry trees will line the entire main aisle of the first floor, as well as in Macy's fountain atrium and the Walnut Room. An immense rose bed boasting blooms in a variety of colors will be planted in the middle of the main aisle showcasing Macy's own Pride Rose. Some of the special events surrounding Macy's Flower Show, which continues through Sunday, April 19, include the "Bouquet of the Day" program, which features the work of five local floral designers (Anthony Gowder Designs, Bukiety, Hello Darling, Stems and Cornelia McNamara), who will each make one-of-a-kind creations; and floral tablescapes set up in the sixth-floor china department using patterns by Mikasa, Wedgwood, Martha Stewart Collection by Wedgwood, Heart Soul Style by Rebecca Moses and a Wedgwood & Waterford table inspired by the Showtime drama, "The Tudors." In addition, a variety of daily plant seminars, shopping parties, family fun days, chef demonstrations and more will accompany the Flower Show festivities. For green thumb guests who want to experience the displays from an insider's perspective, there will be complimentary tours led by University of Illinois Extension's Master Gardeners available Thursdays through Sundays at 11AM, 1PM and 3PM. The Macy's Flower Show is open during all regular store hours.